We know that it’s not always easy coping with the idea that you might be gradually balding. Great hairstyles for men with receding hairlines are hard to find, and even more so ones that are also suitable for your personality. 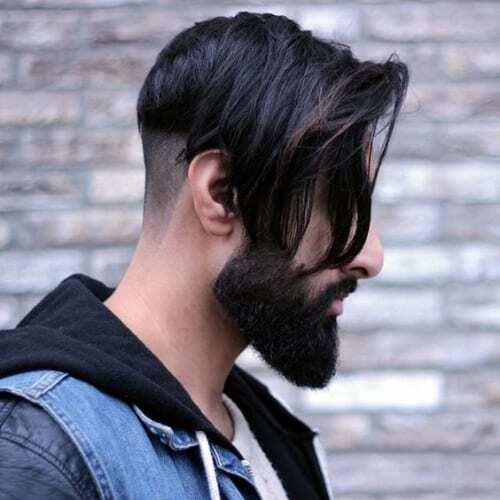 However, we hand-picked a batch of some of the best hairstyles for this, whether you want to accept and embrace your receding hairline or cover it up, all of them below. 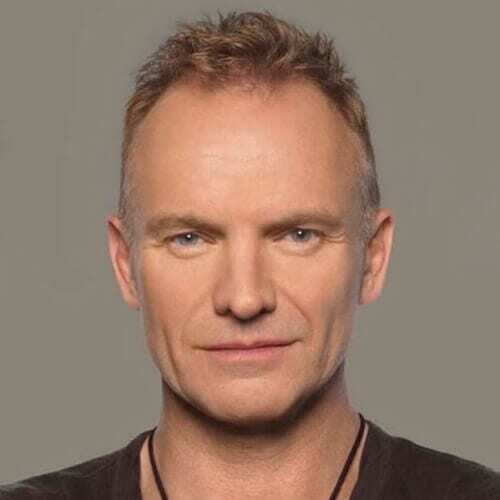 Sting proves that a receding hairline should never stop you from making a confident appearance anywhere you may go. The award-winning musician comfortably sports a short and spiky hairstyle that complements his features. 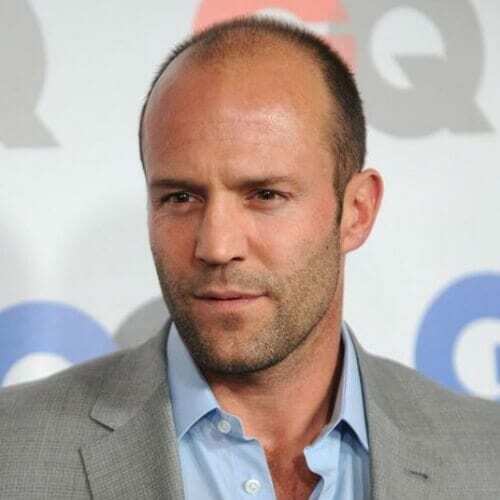 Jason Statham is yet another man that we frequently look up to for his attitude. In addition, his style is flawless, and he rocks a buzz cut like no other. You can clearly observe that a super short haircut like this will cover up your receding hairline well and can accentuate your features. If you have a widow’s peak and you’re not afraid to showcase your rebellious personality, this haircut is undoubtedly for you. Although it helps if the rest of your hair is long and thick, you can pull it off with just about any hair after it has grown a few inches. Bet you didn’t even notice the receding hairline from the first go. 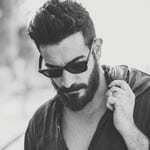 Some of the best hairstyles for men with receding hairlines that want to hide this fact work by drawing attention to other areas of the head and face. To put it more clearly, focus on an eye-catching haircut that won’t allow people to notice the hairline, a taper fade haircut, for example. 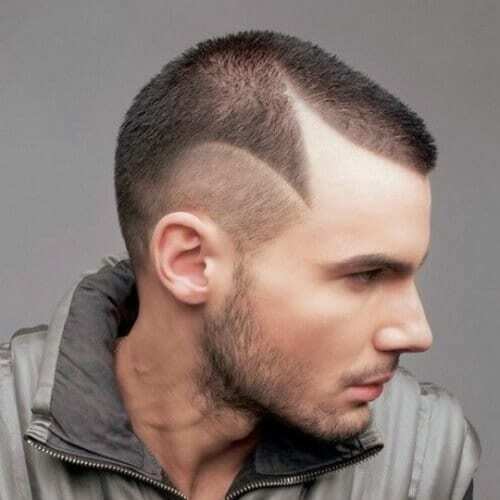 One of the best ways to balance out a receding hairline is with an edgy undercut. 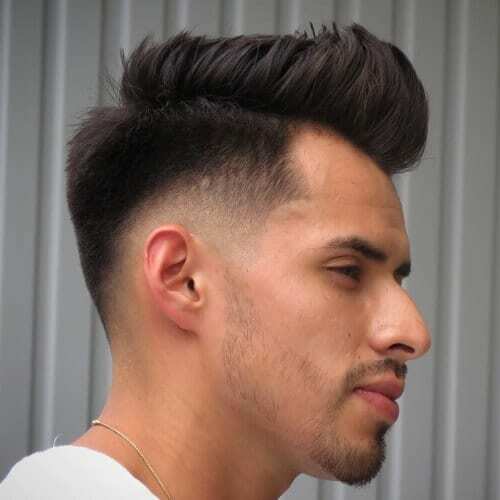 Although it may not be suitable for all men, anyone with an outgoing personality can easily make the two work flawlessly, especially with longer hair on top. 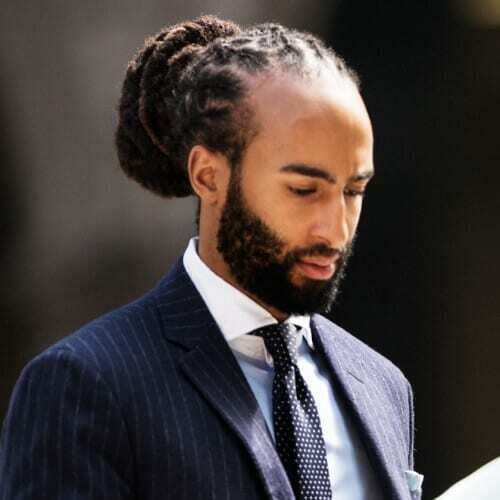 Considering that black men have a trickier natural hair texture than Caucasians, they often opt for keeping their hair very short if they have a receding hairline. All in all, it’s easier to maintain and it’s one of the most flattering choices. 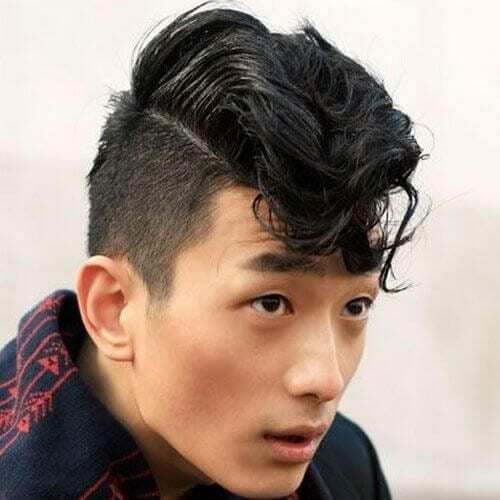 Take a trip back in time with a dapper pompadour haircut. 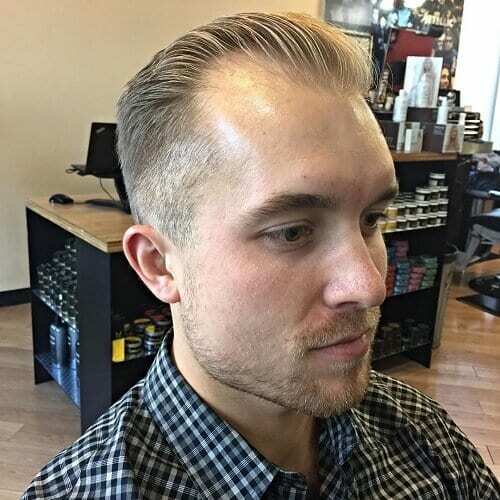 This is a timeless choice among hairstyles for men with receding hairlines, as it adds a dash of class that can have a huge impact on your appearance. Make an unforgettable impression! 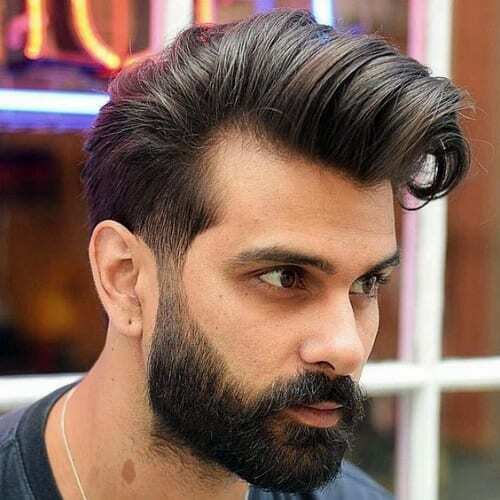 Just like the pompadour, the quiff is a classy hairstyle that guys with receding hairlines will have no problem wearing. Even though it looks remarkable on any hair texture, you get the best results if you have naturally straight hair. The beard also adds an extra something to the overall great look. If you are a military man or had one in the family, you will already know all about the regulation cut. 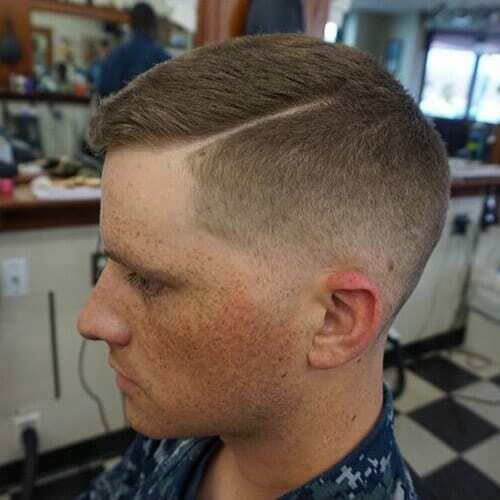 For those who don’t, the regulation cut is the most popular military haircut that involves keeping the hair a bit longer. It’s an excellent choice for a man with a receding hairline. Masking a receding hairline is often easier than you might think. In some cases, it’s as easy as growing your hair a bit longer and combing it to the front for some bangs. Although it may not solve the problem entirely, it will help cover up any undesired features in that area. 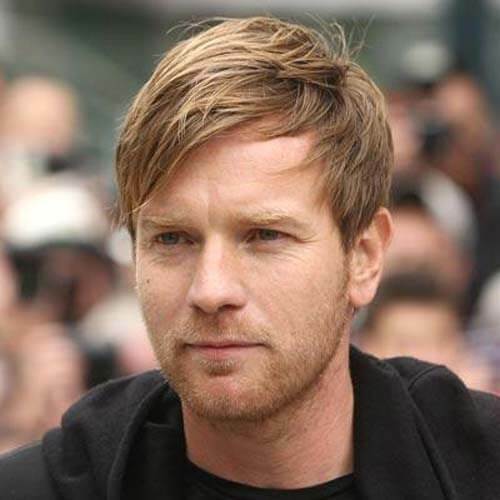 Ewan McGregor looks so cool with it. If you want to add irresistible allure to your hairstyle, seek no further. 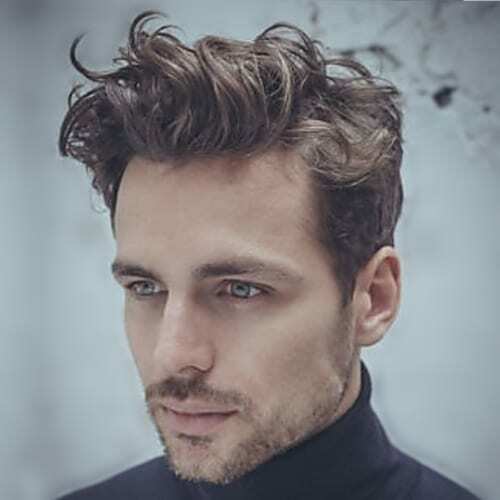 Not only is this one of the most flattering hairstyles for men with receding hairlines and medium-length hair, but it’s an extremely classy choice for anyone with style. 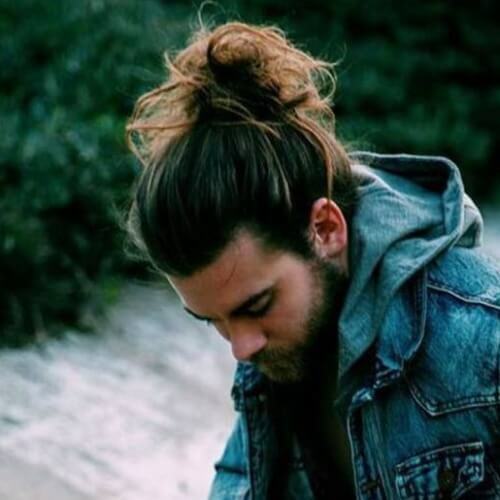 In recent years, the top knot has taken the men’s hairstyles scene by storm. It’s a youthful choice that is also a very effective hairstyle. Like other examples on this list of hairstyle for men with receding hairlines, it brings attention to a different part of your hair. Who says you have to go with the crowd when it comes to your hairstyle? If you have a bold personality, never hesitate to show it through your grooming choices. 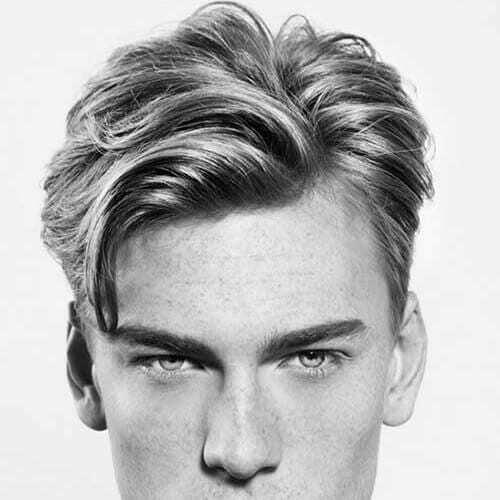 This long, edgy haircut is amazing for concentrating on your assets and forget all about the hairline. Why not experiment with an artsy and stylish hairstyle to make the most of your features? 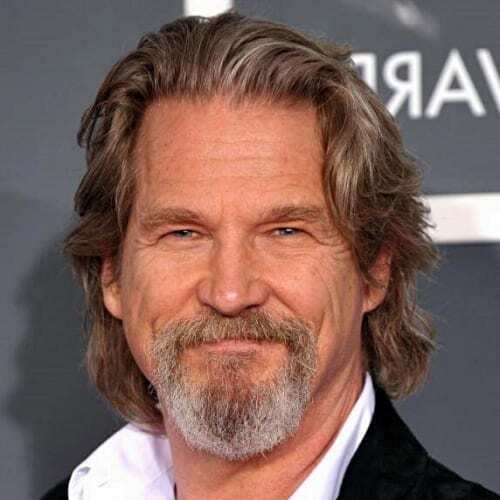 Sporting shoulder-length hair is a terrific way of flaunting your tasteful side, just look at Jeff Bridges. Don’t forget the layers to top off the look. 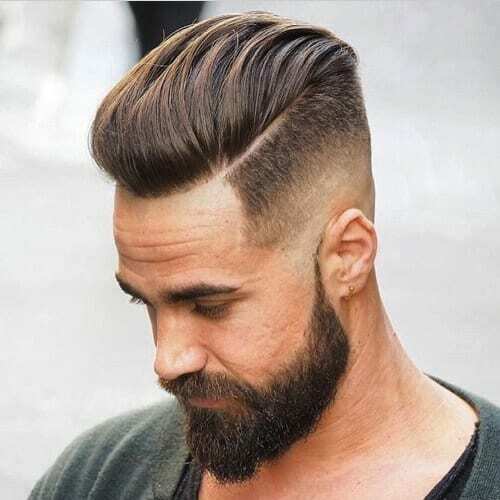 You can never go wrong with a hipster approach to get a smooth hairstyle. 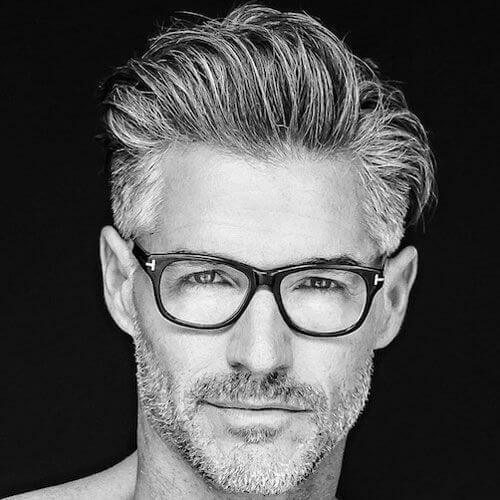 If you have curly hair, you can rely on this handsome style to get the visual impact you’re looking for. Simple style your strands to the side in a casual fashion, and cover or even expose your hairline. Generally speaking, dreadlocks are a cool hairstyle that you can also use to pay homage to your cultural background. As far as hairstyles for men with receding hairlines are concerned, it is a stylish way to bring out the best in your appearance. With a sleek hairstyle like this, it will seem as if you freshly rake your hands through your hair at all times. Men with wavy hair should definitely keep this option in mind when thinking about changing their look. 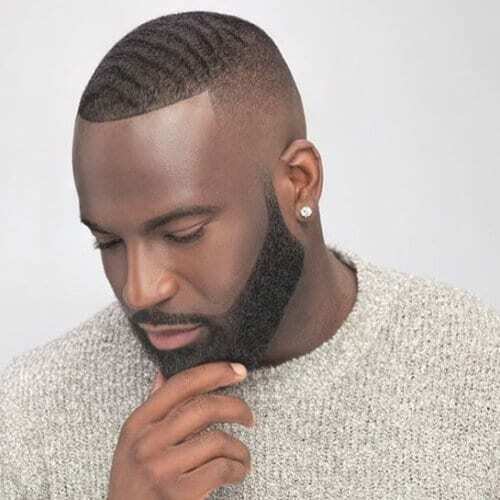 While this particular hairstyle won’t do an outstanding job of covering up your receding hairline, it’s an exceptional way to stylishly embrace it. Any type of combed back or slicked back hairstyle will provide any man with a polished look. Here is yet another spiky hairstyle that serves as a smart choice for a man with a receding hairline. It has a young and fresh aspect that will emphasize your strong points. 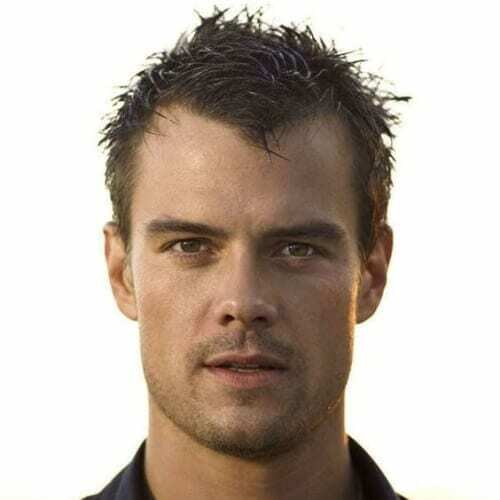 Don’t forget to use some hair product to obtain that wet look and be as cool as Josh Duhamel is in the picture above. The comb over is the go-to hairstyle for any man with a strong sense of style. Whether or not you have a receding hairline, this specific style will most likely never go out of fashion anytime soon, for obvious reasons. 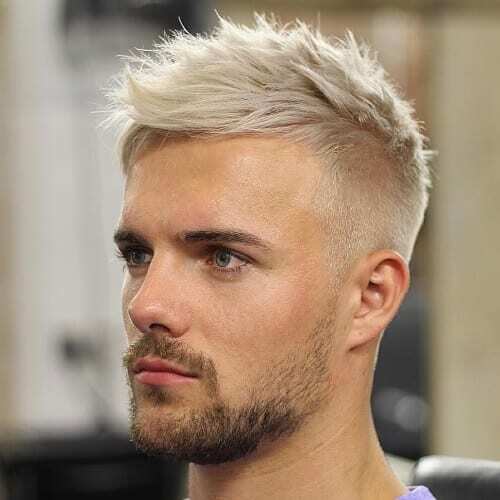 If you’re not one to rock flashy hairstyles, you can always opt for the classic approach to your look. Even though you’re going for a traditional hairstyle, this doesn’t mean that you can’t look dashing. For instance, this short haircut is ideal for any gentleman with a receding hairline. Who better to look at for hair inspiration than one of the most endeared sportsmen worldwide? 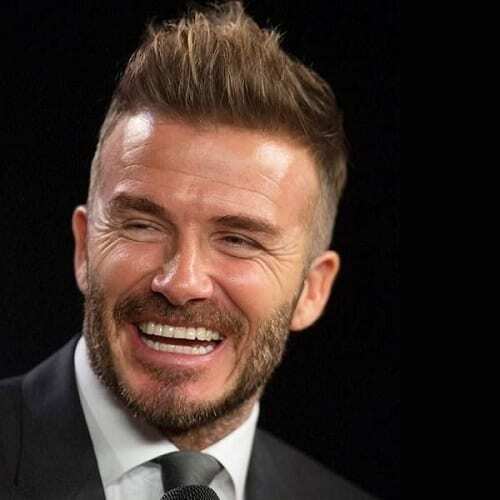 We all know that David Beckham has a receding hairline, but he intelligently works with it by sporting a short faux hawk, in this case. Whether or not you’re looking to change your look for the summer, this is a bright hairstyle that can keep you flawless all throughout the year. Get an undercut and, provided your hair is long enough, toss the top part carelessly to the side and mask that receding hairline. A strategic way to mask a receding hairline is to go for a textured look. 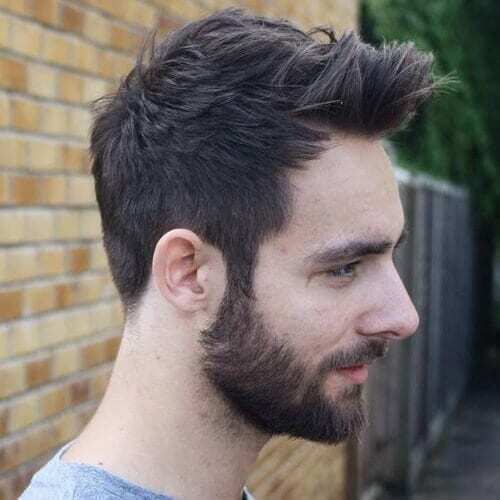 You can achieve this by getting a layered haircut that leans towards the front. 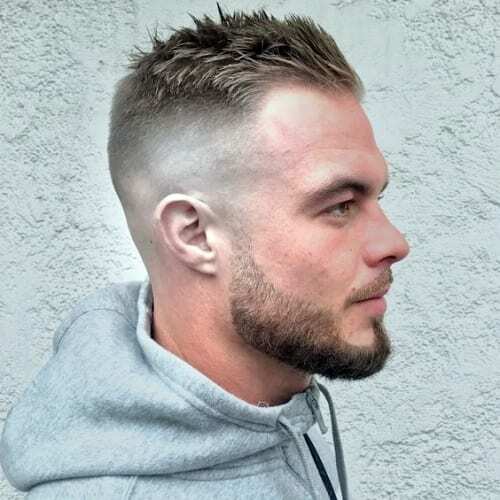 Like with many other hairstyles for men with receding hairlines, an undercut can also add to the good-looking results. Simultaneously add volume and shape to your appearance with a swept up hairstyle. Not only is this a technique to get a polished man look, but it’s also an impressive way to cope with any kind of receding hairline. A hard part can have a massive impact on any man’s haircut, not just on hairstyles for men with receding hairlines. If you want an Ivy League kind of look for your hair, think about getting one of these preppy, clean-cut styles. Why struggle with constantly covering up a receding hairline when you can eliminate it completely? There’s no shame in sporting a bald style, especially if you have a generally sturdy build. You can play around with facial hair ideas for completing the look too. To continue the idea that bangs can work wonders for receding hairlines, here is an attitude-filled hairstyle that proves our point. The long hair is sleekly styled frontwards, successfully shrouding the forehead. Moreover, the shaved sides make the hairstyle all the more appealing. 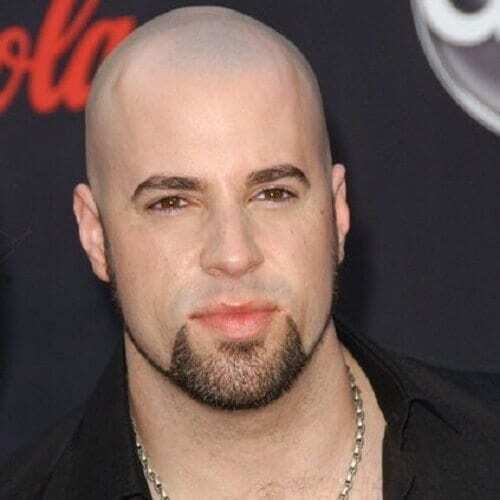 You can conquer baldness like a rock star with this kind of haircut. 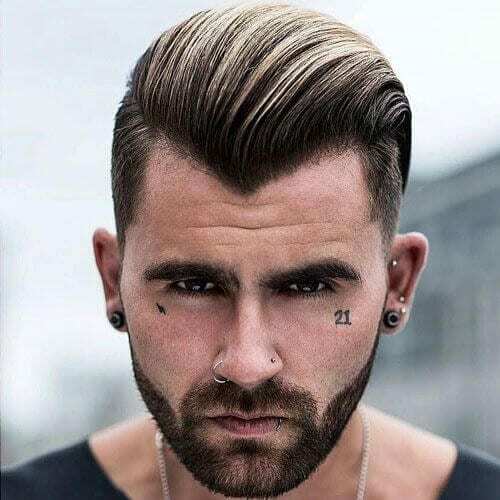 The undercut is an awesome statement, and the top part is cleverly styled to reduce the impact of the receding hairline. Keep the V-shaped styling in mind no matter what haircut you choose. If you follow us often, you will notice that we always talk about the power of the line-up. 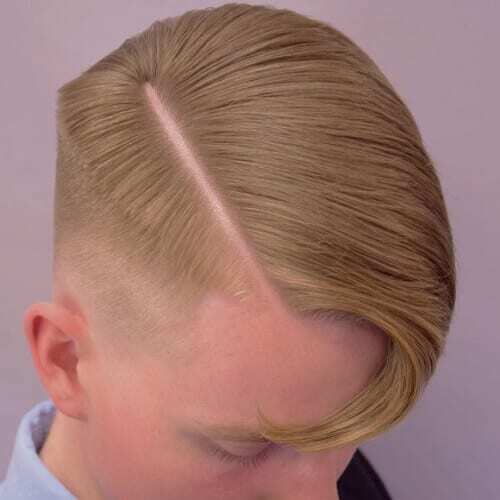 It’s a barbershop grooming technique that focuses on shaping one’s hairline in a flattering manner. 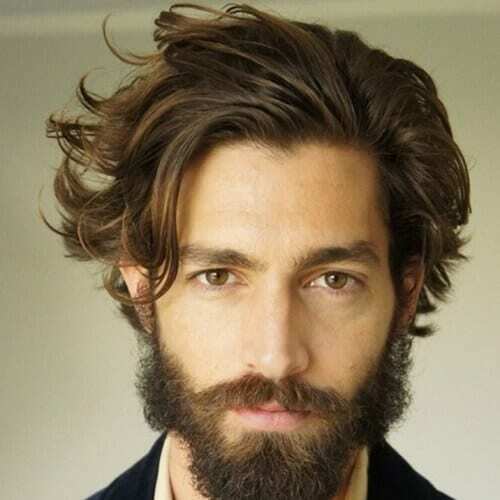 You can pair it with facial hair or deep waves, like in the example above. No need to mask a receding hairline when you have imagination on your side. You can get extremely creative with your hairstyle and use your hairline to your advantage. This photo shows just one alternative for accepting your hairline and taking it to the next level. Are you looking for a casual hairstyle that will still work in a professional setting? This is the medium-length haircut you’ve been dreaming of. It’s incredibly adaptable, all while contouring your face in the best way. Push your edginess to the limit by going with a mohawk. 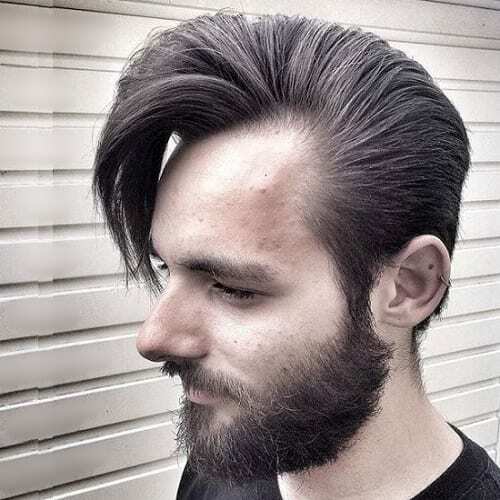 Even though not all men can have this kind of hairstyle due to school or work restrictions, it’s an amazing hairstyle that is manly and sharp-looking at the same time. Are you forever a 90s baby or carry this decade in your heart? You can let the world know about it through your hairstyle. 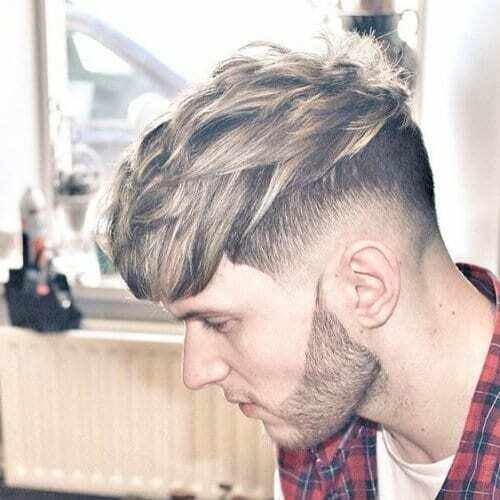 Despite the fact that this shaggy layered haircut isn’t currently among trending hairstyles, keep these words of wisdom in mind – fashion fades, style is eternal. 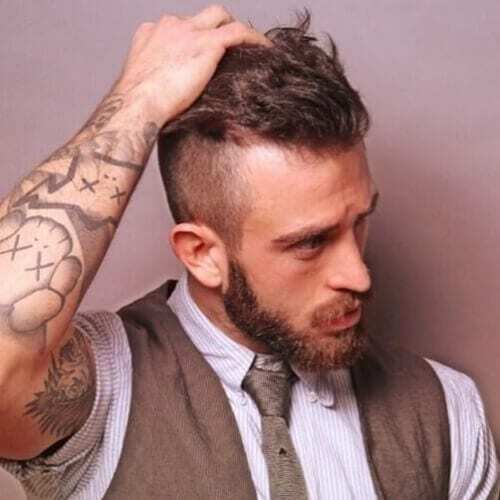 The faux hawk is the best alternative for men who aren’t willing to shave their heads to get a mohawk. 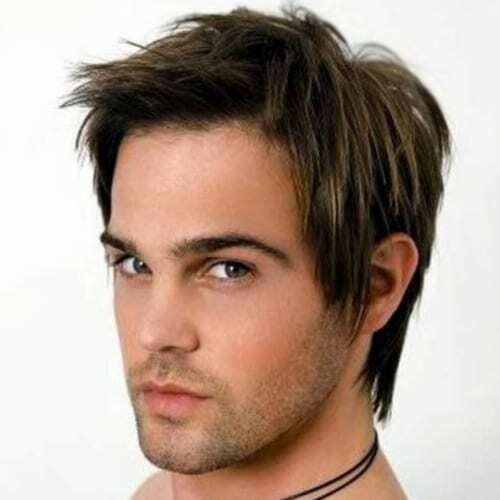 Additionally, it is one of the top hairstyles for men with receding hairlines that have naturally thick hair. 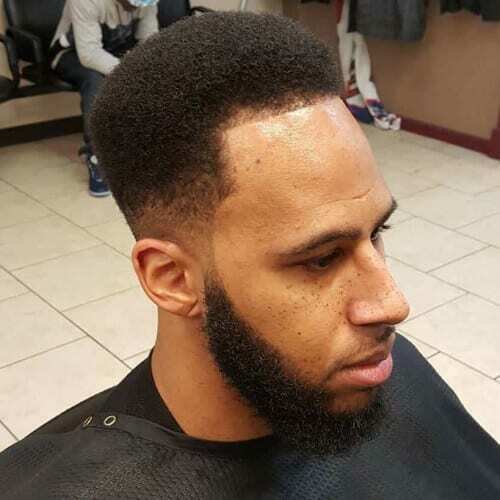 The flat top is a hairstyle staple for men in the African American community. It’s a top hairstyle for accentuating afro-textured hair, especially if you’re battling a receding hairline. Even though our example shows a rounded version of the flat top, you can opt for any approach and adapt it to your needs. 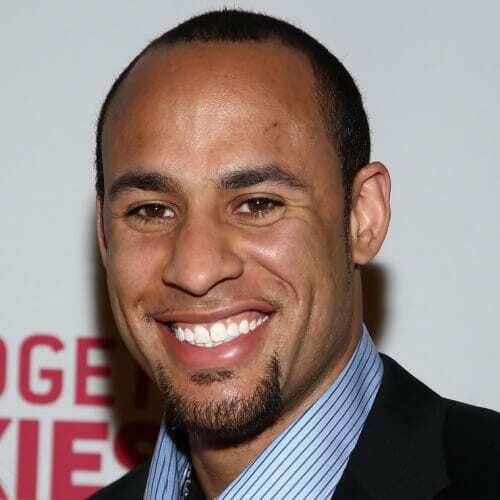 Some men try to wrap up receding hairlines to hide them while others do the exact opposite. However, there is also a third category – those who want to subtly cover their forehead. We recommend it entirely, with some extra help from well-trimmed layers that won’t stand out as a cover-up strategy. Everything about this look just expresses coolness. The receding hairline isn’t even an issue anymore, thanks to the undercut and long fringe combo. Let’s not even begin to talk about the thick and well-groomed beard. 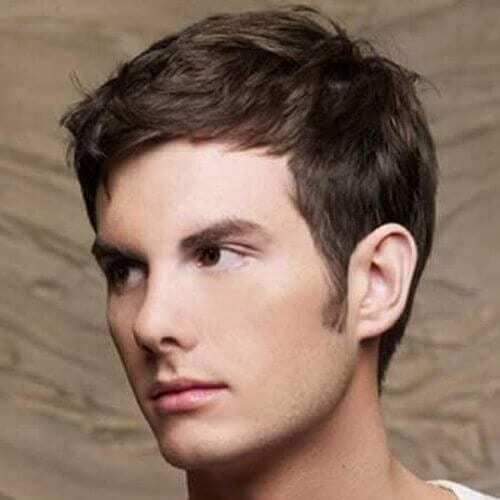 Aside from the buzz cut, crew cuts are some of the most effective military hairstyles for men with receding hairstyles. Even if you’re not in the military, you can adorn this low-maintenance haircut and reap all the benefits. Want to get the refined look of a slicked-back hairstyle without terrorizing your hair with products? All you have to do is get this haircut and comb it back. Please note that straight and soft hair works best for this hairstyle. These long and wavy side bangs prove that covering up your balding areas can be a breeze. 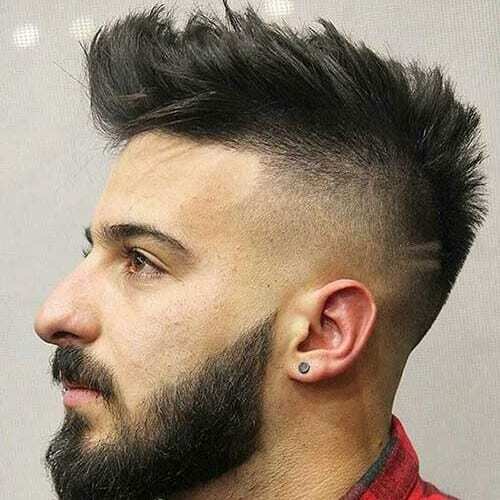 Even though it’s generally recommended for young adults, older men can wear this mid fade style just as well. We’re back to bangs for this example but with a choppier approach this time around. The base has a modern Caesar haircut feel to it, and it’s spiced up with scattered highlights. The undercut fading is also extremely well-done. 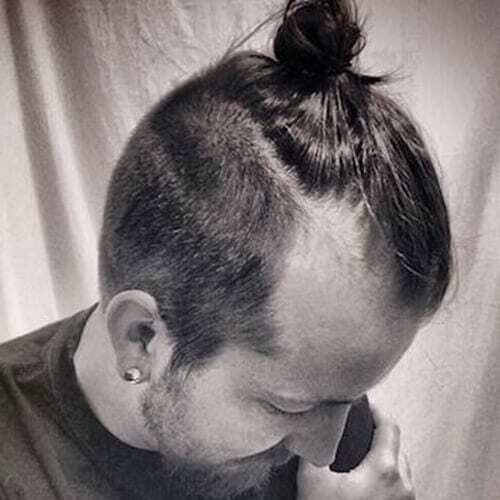 If you rock a spectacular man bun, it won’t even matter whether you’re tackling a receding hairline or not. 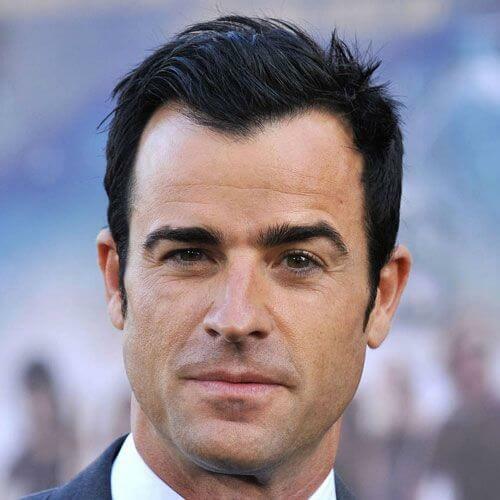 For the past few years, this has been a top-trending hairstyle for all men who prefer longer hairstyles. 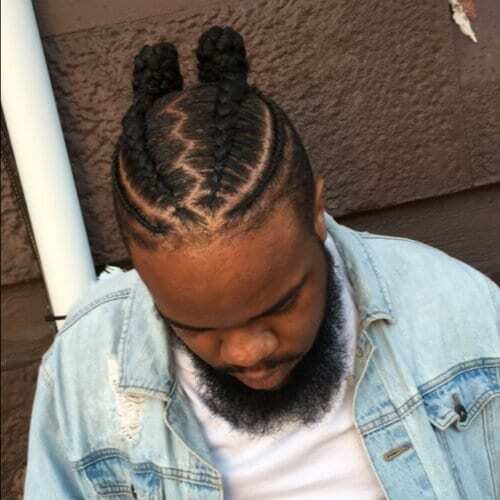 Step up your style game with an awesome braided hairstyle. There are plenty of options you can explore, from shorter ones (like in this example) to long cornrows. Regardless of what braiding style you choose, make sure you get them done by a professional so that it will last. 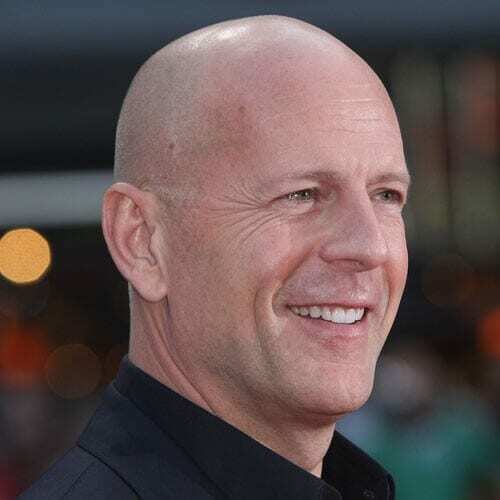 Bruce Willis proves that you can successfully sport a bald head and a beardless face for a polished and clean shaven look. 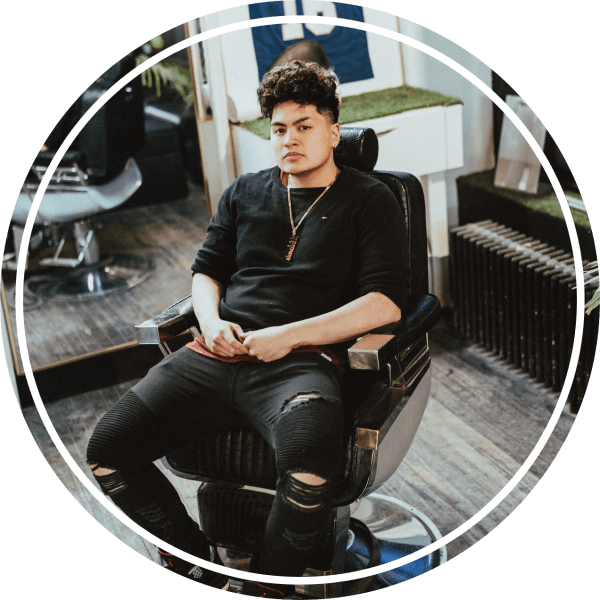 The only slight challenge you’ll be facing from now on will be the frequent shaving, but it’s a lot easier than the long-term maintenance that most other hairstyles come with. Remember what we said about moving the attention from a flaw to a strong point? The same rule applies for this style that plays with its wavy, messy, shoulder-length hair that certainly steals the spotlight. 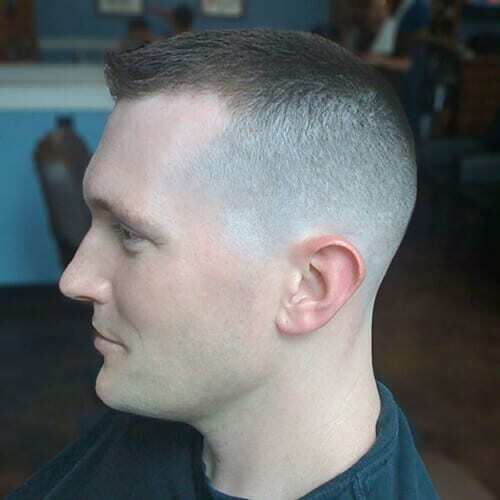 If you’re into military styles but you find the crew cut too boring, you can consider getting a high and tight hairstyle. 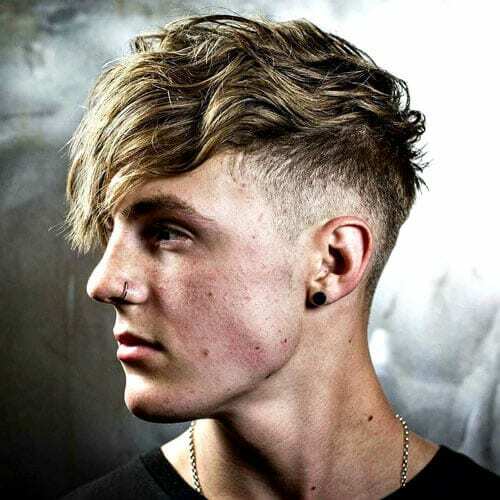 It’s similar to the aforementioned haircut, but it stands out through the undercut that accompanies it. 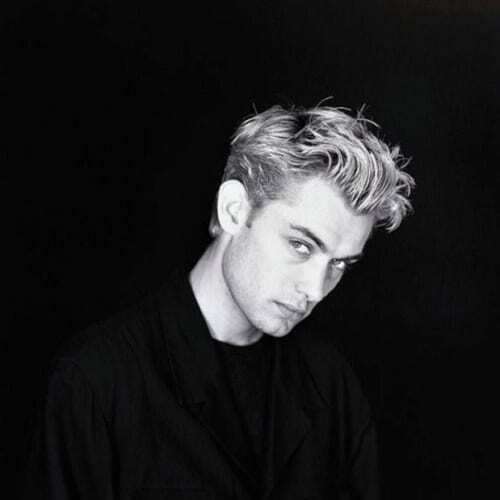 Jude Law is a great source of inspiration for hairstyles for men with receding hairlines. Having sported his fair share of cuts, from crew cuts to curly and wild ones, we have to say that this is still one of favourites. We firmly believe that age is just a number and that you can feel and look youthful at any stage of your life. So you shouldn’t hesitate to freshen up your look with a tousled hairstyle even if your hairline is just barely receding. Last but not least, we offer yet another simple yet brilliant approach to hiding your receding hairline. 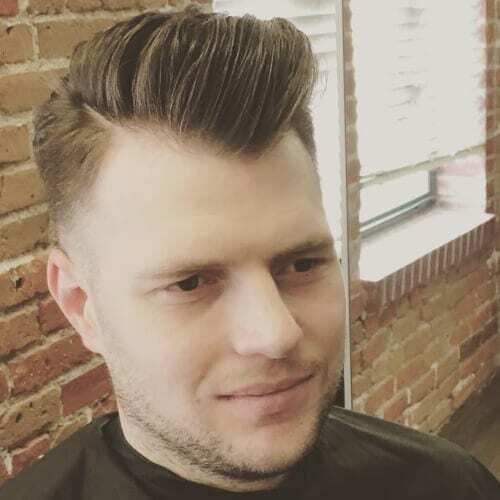 As you can see in the image above, a few layered strands are styled and brought to the front to cover up the key areas where balding has started to occur. 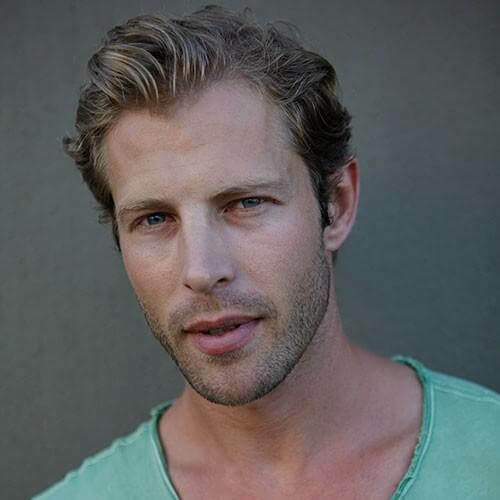 To put it all in a nutshell, these hairstyles for men with receding hairlines can ease your lifelong battle with progressive hair loss. We guarantee that any one of these choices will help boost your attitude regarding your appearance, no matter if you chose to cover or show your hairline. Either way, rock your hairstyle with confidence! Hi, Lucas! Thank you for pointing this out. This was not auto-generated yet it’s several years old and it’s in desperate need of an update. As you can see if you look at our homepage we’ve started significantly updating our articles – we’ll add this one to the list!